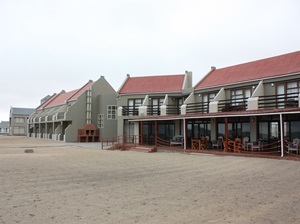 Category Archives: "Swakopmund and Skeleton Coast"
Alte Brücke Resort is situated within walking distance of the beach, near the Swakopmund Aquarium. The resort offers self catering chalets, fully-furnished and equipped, including breakfast. The conference centre will cater for all your business requirements. The resort also have top of the range camp sites, fully lawned and paved, consisting of individual ablution facilities, wash-up, braai and power points. Accommodation consists of 23-luxury self catering chalets (sleeps 1-6) complete with telephone, TV, microwave etc, serviced daily. The scrumptious buffet breakfast is included in the bed price. Secure camping facility is top class, each stand has its own private bathroom, fire place, wash up, power point and lawned area. 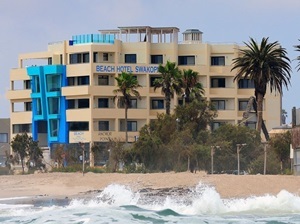 The new 3 star hotel is located only 50m from the Atlantic Ocean and within walking distance to the centre of Swakopmund. The combination of modern architectural styles with glass fronts and classic furnishings are exceptional. The hotel has 5 different room categories, all with balcony and sea views. In addition to a fully glazed lounge the hotel offers a roof terrace with a swimming pool and an amazing 360 degree view over the city, the dunes and the Atlantic Ocean. 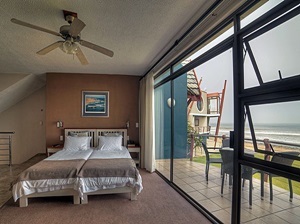 The Swakopmund Sands offers 19 luxurious rooms ranging from Luxury Suites to Single and Family Suites. The hotel is literary minutes’ walk away from the very popular Jetty and TUG restaurants as well as other tourist attractions and yet you have total privacy once on the premises of the Hotel. Each room is equipped with a flat screen TV, safe, under floor heating, fridge ,as well as tea and coffee facilities for your convenience.A laundry service is available for same day delivery. Each bathroom has a hairdryer and shaving facilities and all international power points can be used. 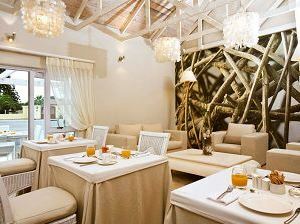 In the morning you will be able to enjoy a sumptuous buffet breakfast in a very relaxing and tranquil dining area . In our lounge you will be able to enjoy the comfort of our couches whilst sipping a sundowner after a tiring day out, or just to connect with the outside world via Wi-Fi. The Hotel offers secure parking at all times. Perfectly positioned the luxurious Hotel Zum Kaiser offers direct access to the beach and the town's vibrant street life, quaint architecture, shopping and fine dining. This exclusive hotel houses 21 fully air-conditioned bedrooms, each featuring a full en-suite bathroom, television, coffee-and tea making facilities, bar fridge, electronic safe and wireless internet. The tastefully decorated hotel offers a combination of Court Yard Suites, Front Facing Suites and 3 Family Rooms with inter-leading doors. Each of the Front Facing Suites is equipped with a private balcony to enjoy splendid views of the historic town and partial views of the nearby Atlantic seaboard. Enjoy delectable cuisine at the on-site Bistro Zum Kaiser and sip sun-downers whilst experiencing the spectacular sunsets over the Atlantic from the hotel's idyllic Roof Terrace. The Hotel Zum Kaiser is fully equipped and offers the ideal setting for conferences, banqueting and celebrations. Cornerstone Guesthouse offers the charm and intimacy of a family-run B&B combined with the modern amenities of a luxury hotel and is a small, private and peaceful bed and breakfast an easy walk to the sea and the town centre of Swakopmund . Cornerstone Guesthouse offers five double or twin rooms. The rooms each have a private entrance and patio with table and chairs; inside, the rooms are light, spacious and neat with tile and wood floors, beach house colours and your choice of double or twin beds. 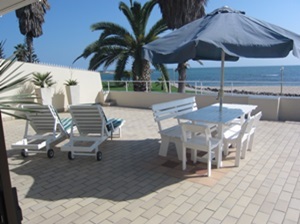 Comfortable Self-catering Accommodation in Swakopmund, separated from the sea by the promenade and a well-tended public garden. 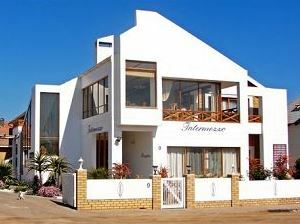 An Der Mole is a luxury apartment in a prime location on the edge of Swakopmund's main swimming beach. 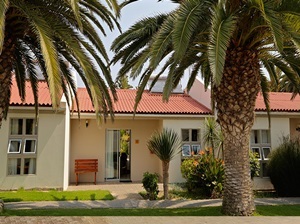 The self-catering villa has three bedrooms and two bathrooms with a main en suite. The massive balcony has a barbecue that overlooks the sea and the apartment is fully furnished to luxury standards. The guesthouse offers four standard rooms, seven luxury rooms and one family suite all en-suite for guests wanting to indulge in a comfortable stay-over close to the ocean. 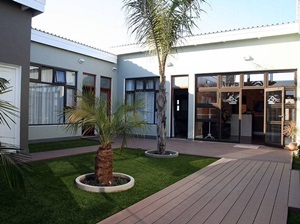 The Swakopmund Guesthouse offers more than usual by providing guests with a scrumptious breakfast buffet, catering for more up market traveler, and facilities ranging from laundry services to "anything else that guests might ask for". This includes a shuttle service and wheelchair-friendly accommodation. All rooms come complete with minibar and television. The four star Hansa Hotel is situated in the centre of Swakopmund and offers easy access to everything Swakopmund has to offer. The Hansa has 58 superb twin/ family rooms including 5 luxury suites, all with bathrooms en-suite, under carpet heating, 8 channels TV and all other amenities. 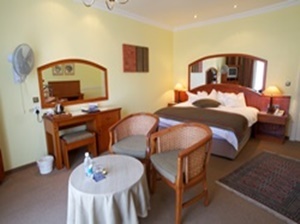 Other services available at the Hansa Hotel include laundry and valet service, baby sitting, secure parking, private bar with open fire place and a fully equipped conference room. The restaurant is among the most popular in Swakopmund; the residents bar features a large fireplace, which offers welcome relief from the cool Swakop night temperatures. 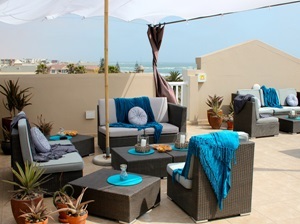 A secluded garden courtyard, which is well protected from the Swakopmund weather offers a place to linger. "Villa Wille" was built in 1909 by Hermann Wille and converted into a first class hotel in 1999. 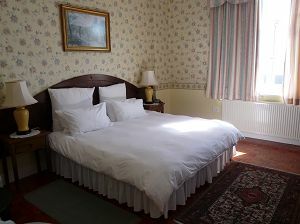 The rooms are furnished in the Victorian style. Altogether, the hotel offers 16 double-bed rooms and one single-bed rooms, each of which come either with a bath or shower cabin. All rooms are equipped with a television, telephone, mini bar and hairdryer. 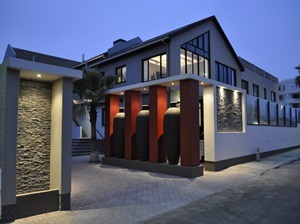 The underfloor heating will ensure that the rooms remain cozy and warm on cold Swakopmund days. The honeymoon and VIP suites offer you luxury in a distinguished manner. 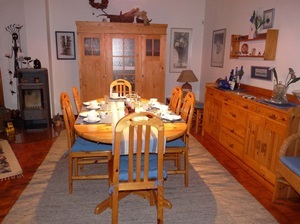 Meike's Guesthouse is conveniently located close to the city centre. The bright and stylish rooms are equipped with refrigerator, TV, tea and coffee making facilities and a hairdryer. The en-suite bathrooms are modern and have a walk-in shower. All rooms have a private veranda. Internet access (WiFi) is available for free. A rich, healthy breakfast buffet awaits you in the morning. The guesthouse offers five spacious double rooms, equipped with twin beds. Of these, four double rooms / bathrooms are wheelchair accessible. For families, two family units are available, each with four beds and an en-suite bathroom. An apartment is equipped with living room, kitchen, two bedrooms, bathroom and guest toilet. The accommodation offers 4 stylish rooms with TV, fridge and private veranda; safe parking in a quiet location. 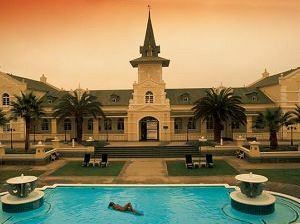 The Swakopmund Hotel & Entertainment Centre is a 4-star luxury establishment. From the light and airy hotel foyer to the 90 spacious bedroom units and two luxury Presidential Suites, guests are hosted in luxurious surroundings with a winning combination of the friendly hospitality for which Namibia is renowned and the ultimate in service and style. The pool area is a sparkling blue oasis amongst palm trees, fountains and furniture made to laze on in unadulterated comfort, offering welcome respite from the heat of the Namib Desert. 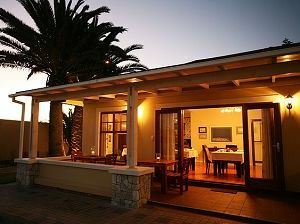 Desert Breeze is located a few minutes' drive from the centre of town on the bank of the Swakop River. Desert Breeze offers 12, all en-suite, luxury bungalows and one exquisite villa, each with a private balcony from where to admire the breath-taking view of the dunes. Each bungalow and the villa are equipped with wireless internet, mini bar, coffee and tea making facilities and digital safes. The breakfast facility, with it's unbeleivable view, serves only the freshest of produce for breakfast. Seating is available indoors or on the deck for guest to enjoy the view and peaceful atmosphere. Secure parking as well as laundry facilities are available. 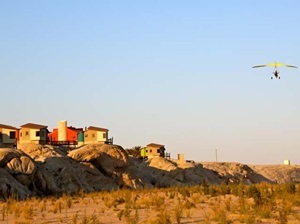 Gecko Ridge is a real oasis about 15km from Swakopmund along the Swakop river. The gym, outdoor lapa and a number of bedrooms overlook a partially enclosed large swimming pool. Beautiful wooden sun decks situated over ponds of running water allow for a well deserved sundowner to be enjoyed, while viewing the amazing sunsets over the Namib desert and moon landscape. Just outside the fog line, Gecko Ridge enjoys beautiful sunny days and are therefore also the ideal setting for private and year end functions. We offer 6 Luxury Rooms, 2 Self Catering Chalets (Pet Friendly), 10 x Camping Sites, a fully equipped gym, swimming pool, satellite tv, wifi and lots more. Intermezzo Guesthouse is a small bed and breakfast, tucked away in a peaceful area, only 2 minutes walk from the beach, 25 minutes from the centre of town. The guesthouse offers 9 spacious, bright and clean rooms, all en-suite equipped with telephone and tea/coffee facilities. Get a good start for the day with our delicious breakfast and fresh grounded coffee. Relax in the tranquil garden, or enjoy yourself with a good book in our Reading Lounge. 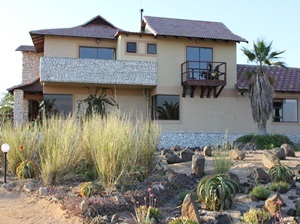 Situated within sight and sound of the mesmerising Atlantic Ocean, The Atlantic Villa offers accommodation within walking distance from the beach, a few minutes drive from Swakopmund town centre and a quiet relaxed atmosphere complimented by its location. Accommodation at Atlantic Villa consists of five main facets, namely the Luxury Suites, Standard Rooms, Deluxe Rooms, Luxury Rooms and Self Catering Units. Atlantic Villa has the facilities to accommodate a variety of travellers. The main house consists of five rooms of which two is luxury rooms. In addition four family apartments are available and suitable for self catering. 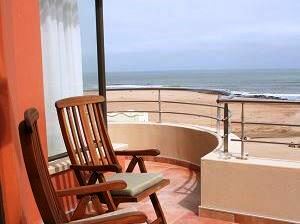 To conclude our accommodation bouquet we also have 4 Luxury Suites with a sea view. Rooms are equipped with DSTV and internet while some rooms have a private balcony with views of the surrounding desert and ocean. Beach Lodge is the only Hotel Pension directly on the beach! Enjoy the magnificent view of the sea from each room, listen to the waves and smell the fresh sea breeze. The lodge is situated about 5km from the town centre. Beach Lodge offers 15 rooms in different configurations and is the ideal home away from home for the individual traveler, families and corporate travelers alike. The location, architecture, ambience and service will impress you and makes it the perfect hideaway for Honeymooners. All rooms are equipped with telephone, TV, a coffee/tea station and a small fridge. Most rooms are equipped with roof fans and rooms without fire-places are equipped with heaters. Portable braai facilities and wood are provided on request and can be set up on the lawn. Literally metres from the Atlantic Ocean, Cape Cross Lodge presents a unique and serene stop for travellers along this vast untamed and seldom explored wilderness on the Skeleton Coast. 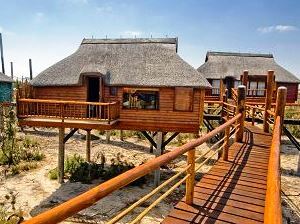 The Lodge is situated 60km north of Henties Bay and 120km north of Swakopmund. Around this idyllic oasis lies infinite ocean and desert, littered with the eerie remains of man’s past endeavours. Nearby, rocky outcrops provide a perfect playground for a large colony of Cape Fur Seals. Visitors can self-drive or even walk to the colony ensuring they first visit the Ministry Office to complete entry requirements.The Lodge offers eighteen sea view standard suites and two sea view semi-suites. No matter the time of day or night, the large sea-facing windows frame breathtaking panoramas that can be enjoyed from every room. All bathrooms are en-suite and while the first floor balconies offer a private space the ground floor balconies also provide direct access to the beach. Four of the bedrooms have been linked with a door to create a family suite when needed. The lodge offers six rooms with wheelchair accessibility. Each of the twenty one campsites is equipped with its own light, with switch and a double 220v plug and own trip switch. A wash basin with cold running water and a work surface serve as an alfresco kitchen. Each site has its own braai area. There is a central ablution facility with showers, hot and cold running water, flush sanitation, hand basins and mirrors. Other facilities for campers include an entertainment room with full DSTV bouquet and a pool table. A separate bar is close to the site.